The recent clashes between Israel and joint Iranian-Syrian forces highlight a long-standing tension in the region, one complicated by the Syrian conflict. With the capture of the Yarmouk camp, the Syrian government has taken full control over the Damascus city governorate. This means it now controls seven out of the fourteen internationally-recognized provinces of the country. This is a map of the reactions of each country that has made statements regarding the Israeli Army killing 60 protestors in the Gaza Strip. Green countries have either directly condemned the Israeli use of force, or have called for a special session in the United Nations. 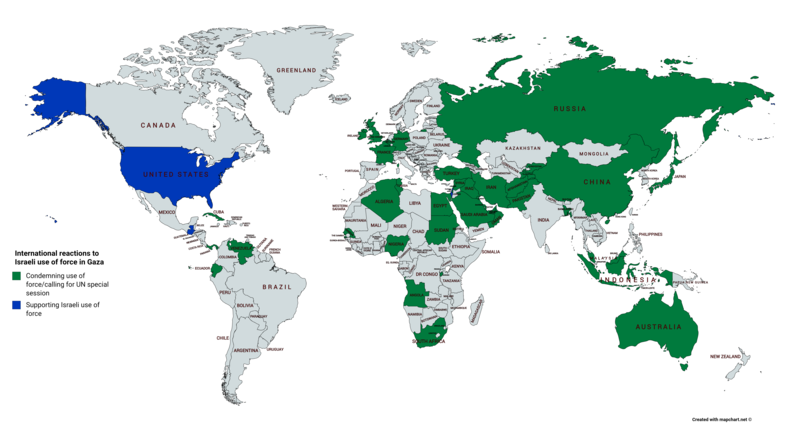 Countries in blue stated support for the Israeli action. In the late hours of May 9 2018, Israel struck an Iranian base in Kisweh, Damascus province and fired artillery and mortars at Syrian Army positions in al-Ba’ath City in Quneitra province. This escalated into a large exchange of rockets and artillery fire. This map shows the provinces where military targets were struck in both countries. Mike Pompeo, the newly-confirmed chief diplomat and former CIA head of the US, is visiting the Middle East. He has already met with his Saudi counterpart and the Prime Minister of Israel. The primary subject of their discussions has been the Iranian nuclear program and the so-called “Iran Deal”. Pompeo has been rallying the main opposition to Iran and its activities in the region. This is a map of countries by number of Syrian refugees present in the country. Please note that this includes total refugees, not just legally admitted or settled but also overstays and illegal crossings. Where do countries all around the world stand on the Syria strike? Where do Middle-East countries stand on the Syria strike? After the US-UK-France strike on Syrian government military facilities on April 14, Middle-East countries reacted largely in an expected way. Syria’s ally Iran condemned the strike, and protesters in Gaza marched against the action as well. Israel’s government, typically opposed to the Syrian government, supported the strike, alongside Saudi Arabia, Qatar, Bahrain, the United Arab Emirates, and the normally neutral Oman. Iraq, Lebanon, Egypt, and Kuwait expressed “concern” over the strike.